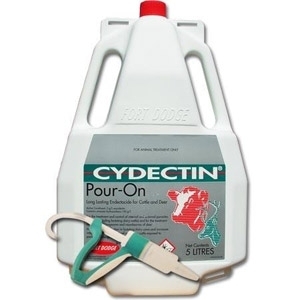 Cydectin (moxidectin) pour-on, labeled for use in beef and dairy cattle of all ages, is effective against a broad spectrum of important internal and external parasites. Includes protection against the Ostertagia ostertagi (brown stomach worm), the most economically devastating internal cattle parasite in the United States, for 28 days. Effective against grubs, lice and horn flies, and is the only pour-on labeled for control of the common scab mite. Formulation remains fully effective in rain. 500 ml.